Years ago we would begin the year by flying down to Las Vegas to attempt to cover the Consumer Electronics Show (you can't walk it, let alone cover it) before flying back to catch the end of Macworld Expo (you know, where the iPhone was unveiled). It felt a lot like being led around on a leash. Dragged to one announcement or another, all we could do was bark with some enthusiasm. There wasn't time for considered analysis or even thoughtful exposition. There never is at a show. All you can do is churn out the news, product by product, company by company, after spending hours on the show floor, skipping meals and shortening sleep to keep the keyboard clicking. You've heard a lot about the new Nikon full-frame flagship dSLR, for example. But who has told you that the Nikon D5's 4K video capture is limited to three minute clips? News like that takes more digging than barking. You'll find this lovingly-restored homage to San Francisco's Doggie Diner at the end of Sloat by the beach. The hot dog and hamburger stand used to do business on the adjacent corner. We captured it last year using a Nikon D200 with a 43-86mm Nikkor zoom and a polarizer at f11, 1/100 second and ISO 100. We processed the DNG in Alien Skin's new Exposure X as part of our testing for the next segment of the full review. Barking may be how the game is played but as our illustration above suggests, there's more to a dog than its bark. A dog, for example, doesn't sweat. That makes a dog the perfect chef. No stove will never be too hot for a dog to slave over. 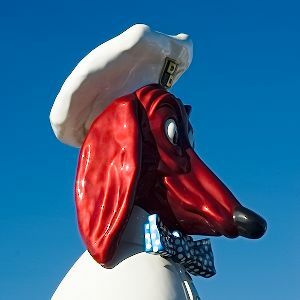 So dress the old pup up with a chef's hat and a bow tie and put it to work in the kitchen. Flooded with CES announcements this week, this old dog cooked up what we think is a better way to get you the news using our Horn format, which lists the major announcements with links to the press release and pre-order pages at our affiliates. When you're the chef you can serve the main dish the way you think it should be served. No barking. No sweating in the desert. Just an appetizing dish that leaves you satisfied while avoiding that too-full feeling.